I’m scared of kids and technology. I know that makes me sound like one of those old people who said TV would never last when I was a kid, but technology in relation to my kids totally freaks me out. 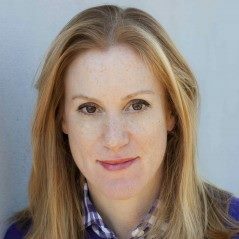 Not only am I scared of the safety concerns that go along with kids having computer and Internet access, but I’m also concerned my kids will grow up to be zombies who don’t know how to function without a screen in front of them. So since our kids’ generation is totally immersed in technology, my husband and I do our best to make sure our kids have a balanced life separate from technology. But something happens, no matter where we take our kids. They try to swipe things that aren’t swipeable! So on a recent visit to the museum, I was somewhat horrified to watch my youngest try to swipe the signage that accompanied a museum exhibit. Despite my kids having very limited access to iPads and iPhones, they still see the world through swipeable colored lenses. Chances are your kids do, too. So prepare yourself. Your kids are going to try to swipe things that aren’t even attached to a plug. 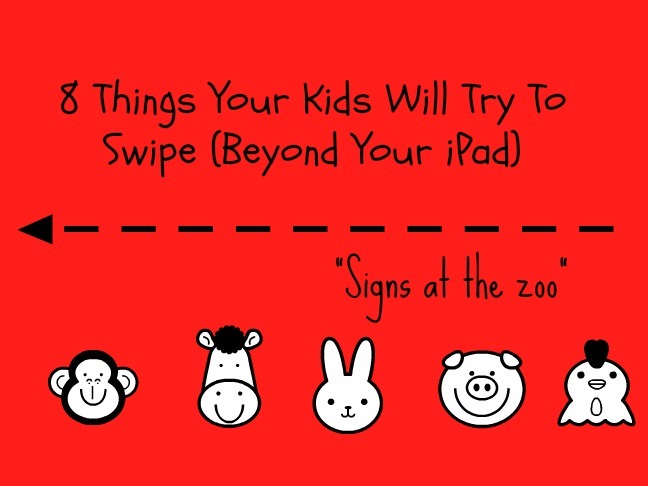 Here’s 8 things my kids have tried to swipe. Have yours? My daughter thought the screen at the movie theater was a giant iPad that allowed her to watch whatever she wanted at any given time. So on her first trip to the movies, she started making a swiping motion and asked how to change the movie as if she were at home cozy’ing up to Netflix! Oops. We got a new TV and both my kids tried to swipe it. This was only problematic because their swiping left some pretty serious fingerprints. So instead of watching TV, they got to watch me spray Windex all over our brand new TV. Yup! That was my kid who, at the Los Angeles County Museum, tried to swipe an exhibit on brown bears. She was pretty disappointed when the exhibit didn’t move. On a recent visit to our pediatrician’s office, my daughter picked up an old Etch A Sketch and tried to turn it on by swiping. When I told her it wasn’t electronic she looked at me like I was crazy. I was pleased, however, to see her have a good time with it regardless. My kids see me working on my laptop all the time. But when I saw them recently try to swipe the screen, I realized they probably think I’m watching “The Thundermans” everyday instead of actually working. We recently took a Memorial Day holiday and both my kids tried to swipe the screen on the seat back in front of them. Not only were they surprised to find out that the screen wasn’t something you swipe, they were shocked to realize this was a screen that only had three viewing choices. The horror! Yes, if you’re still holding on to a home phone — instead of relying entirely on your cell — and your kids are anything like mine, they’ll try to swipe that, too! And though I’m concerned about a generation of children that will try to swipe pretty much everything, I won’t worry until one of my children tries to swipe me. That’s where I draw the line! Mommy Time 6/12: Father’s Day Gifts for 11 Kinds of DadsGun Safety: Are You Too Afraid to Ask These Questions?